The conjoined image above underscores the relatively short space of time necessary for an abandoned building to decay once it’s no longer maintained. 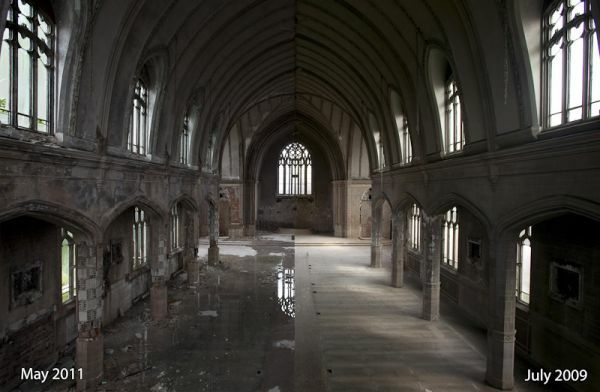 Featured in our 5 Pillars of the Abandoned World article, St Agnes’ Church in Detroit was in good order in July 2009. But by May of last year water damage and mold had caused the elegant masonry to start crumbling. Couple with that the removal of organ pipes, chandeliers, alter and stained glass windows, and St. Agnes’ Church is well on its way to becoming yet another example of crumbling grandeur on the Detroit skyline.